Did you enjoy that after six days of sporting abstinence ? I did. A genuinely good game of football last night I thought. I fancied it might turn into a bit of a boot’n’fist carnival but I could not have been more wrong. Of the build up there seemed to be a little nervousness in the Arsenal camp about the fixture, based on our admittedly dodgy away form and the Woyist wevival down in SE25. When I say the “Arsenal camp” I mean my “camp” of course, my emotional tent flapping in the wind, my pegs loosened. Having watched our top 4 rivals rattle in easy wins in the days preceding the fixture we needed all the points and a limp effort would not have been acceptable. Within a few minutes of kick off however our concerns had been settled. We had the game under control, with 70-80% possession and, yet again, an opponent pinned back in their box and desperately hoofing the all away. The first goal was inevitable because of the dominance, but what a tidy finish from Shkodran ? An absolute poacher’s finish into the bottom corner. Having marked our scorecard we then streamed forward, teased, tricked, chipped and waltzed at the Palace defence, and should have had the second and third goals before half time but the killer blow eluded us. Chances came and went, saved by Speroni, narrow misses by Lacazette. It is the Arsenal way. And then the half time whistle, Zaha in a right teenage tantrum over goodness knows what, and the Selhurst crowd quieter than a church mouse. And then !!! Well I don’t know what Steve Parish is paying Hodgson but he is worry it. He managed to haul his lads back to their feet and send them out with a spring in their step, most significantly Zaha who decided to drop the strop and play football, which he did directly and effectively for the second half. It may actually have helped Wilfried to be given a yellow card by Oliver as he shut up and got on with his job. A bit of highly dubious defending provided Townsend the space for his shot, but a good finish nonetheless. And then it came – the wobble ! The seven to eight minutes we suffer so often in games (that we should be 4-0 up in but aren’t) when we were under pressure, and unable to string three passes together. The home crowd roared – a bad, bad sign. To our considerable credit we settled the wobble down, cleared hard and deep when necessary, and tackled cleanly around our box. Not once last night did the referee have a serious penalty appeal from Palace to look at. And having regained control of the match we surged forward again, capitalising on our dominance through Sanchez with two well taken goals. A final late flurry by the home side was snuffed out by some competent game management in the corners. Three goals, three points, as it should be. Standout performances ? My man was Mustafi. The opening goal I have mentioned above but last night on the pitch was a Palace striker by the name of Christian Benteke. I shall say that name again Christian Benteke. And that is the total number of times you heard his name in open play last night, over 94 minutes. And second in the queue for awards is Jack. He has become a force again with his runs from deep, his strength and tricky feet. Add in the best pass of the evening for Sanchez’s second goal and you have the full package coming together in Wilshere. That will do me. Bit of work today to keep my hand n then a lazy long weekend. See you Sunday. 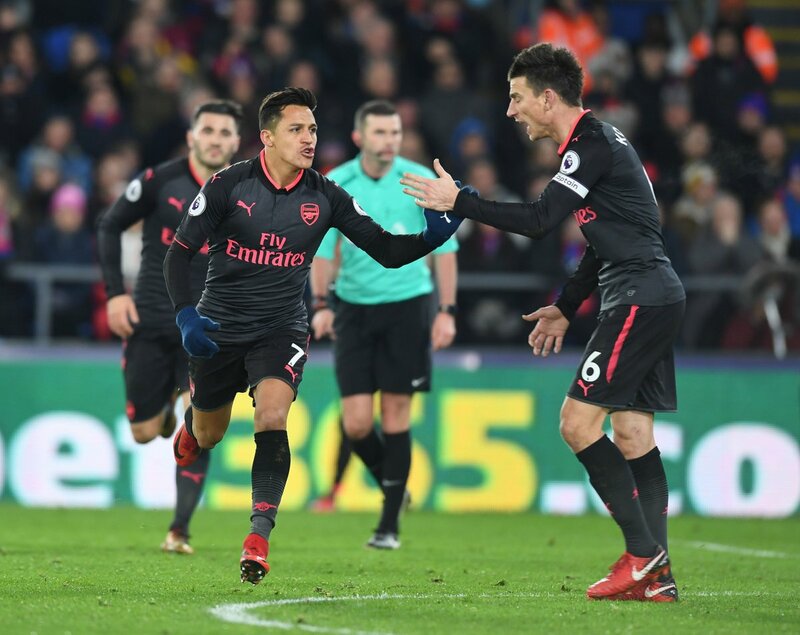 ← Arsenal: Pageant at the Palace ? Pleased that beauty of a pass from Jack was finished so well by Sanchez. I remember Wilshere playing a few sumptuous balls over the top in that good spell he had with England, but nearly all of them were to Rooney, who failed to capitalise on any of them. Also played that dream of a pass to the Ox vs Scotland which Ox scored header from. Be great if Jack can get back his shooting from that period, hit three absolute stunners from range in a week. It will be interesting to see if Jack is ‘rested’ once Ramsey returns to the team. A Wilshere-Ramsey-Xhaka midfield does interest me, assuming a wide player like Iwobi is dropped. I all will depend on the outcome of Alexis moving on, or not. Nice one Andy maybe a little to nice in places but an excellent analysis none the less. Given the apprehension before the game, of taking on an in form palace in their chosen arena, a 2-3 win was in context a good result and one most would of happily taken. However after being very dissapointed at only going off one up at half time, also wondering how we only scored two in the second half and head scratching at the way we conceeded two goals, it feels like a missed oppertunity to rack up a really big score and claw back on some of the goal difference achieved by our rivals. last season we not only missed out on the top four by a single point but also by GD and it looks like being close again this year. We are not conceeding wonder goals ,they are not goals which you would say tactically we were set up wrong there. They seem to be basic errors by lots of players game after game. The first goal Callum was left isolated against a player we know to be their most dangerous and when the the ball was delivered we had lots of players left to deal with the problem but we were marking each other rather than the two eagles in the box. Another problem we struggled with in the second half was the amount of times players were drawn towards the ball and runners were just let go. Just after their second goal three players went towards the ball leaving Zaha sprinting forward with no one with him. This is one of the first things you learn about when defending and so I dont know wheather its lack of communication or tiredness but at the moment its a massive problem. In the end you have to say this was a good win where other teams will struggle and for is a upward curve not a lightning bolt so onwards an upwards. Rightly noted that when we concede we usually go in a “wobble”, and after being made to question ourselves last night again for 5 or so minutes we dugged deep with excellent game management and a desire to win to see the game through. All in all an exciting game for the away support and even better result for the rest of us. I want more of this on Sunday afternoon. What I don’t really understand Ian is why we cannot set up a clear goalscoring chance for Lacazette or, perhaps, vice versa he does not seem able to engineer enough space to get a clear sight of goal without half a dozen defenders in front of and around him. The man works his arse off but it has not quite clicked in the past month around the box. Don’t mention it to a soul DC but the notion of a midfield of Aaron and Xhaka with Jack moving in to fill the Number 10 but starting that creative role farther back interests me. Well done, Anicoll, that was just as I remember it. To be honest I do remember a bit more too. Both the Palace goals were ‘well taken’ but were initially gifted by Arsenal players. The zonal marking system undid us for their first, which came as a result of Bellerin trying unsuccessfully to dribble, again — why does he keep running into rather than around opposition players à la Theo? But when the ball eventually came near our box we had 4 defenders ‘guarding’ their zone, but rooted to the spot, and Townsend could have had time to make a cup of tea before scoring with a good shot. Their second goal was scored when their player was surrounded by Arsenal players, but easily out jumped them all from nothing more that a standing jump, give or take a stride or so. That aside, we played some of the most exquisite attacking football that I have seen in many a day, that sliced Palace’s defence into fine slices, and we could have, and should have been 4 up by half time. I really enjoyed the game – not just for the win – always welcome – but because it had all the twists and turns a football match should have to excite and worry all the fans, including the Palace fans, who have a pretty good team. Loved it. I agree that Mustafi had a fine game, and it would be difficult to disagree with your MoTM choice — but forgive me for saying so, but that guy out there on the pitch masquerading as Jack Wilshere in his pomp, with hard tackles, non-stop running, fantastic passing skills and who was full of heart, from start to finish 90+ minutes later, would have to be my MoTM. Oddly enough, it turned out that it actually was our Jack, appearing like a butterfly from the chrysalis of an unfit, forlorn, shadow of his former self. Sign him up Arsene – he cares – he wants to play for Arsenal !! The man I want tarred and feathered (at least) for the first Palace goal was Kolasinac Henry. Sead seems to follow and is next to Townsend as he Zaha is working the ball on the edge of the box, then stands still as the Palace player wanders over to the penalty spot. As you know, I made a comment about the so-called ostracising of Alexis first thing this morning, and it is worth copy/pasting it, for those who have not seen this mornings papers or heard it on the media. — Good Morning, Guys @ 9:46 a.m. I am not one who is particularly bothered by the media reporting one way or the other. But ……. this nonsense, started by Thierry Henry of all people, saying that most of the Arsenal players disrespect Sanchez and ignored him when he scored, really makes me cross. The nearest players congratulated him when he scored his first goal, and the whole gang mobbed him for that fantastic 2nd goal. I am sorry that he and Özil are likely to leave soon — but when he plays for us – he gets my total support, and I think that is true of the players too. 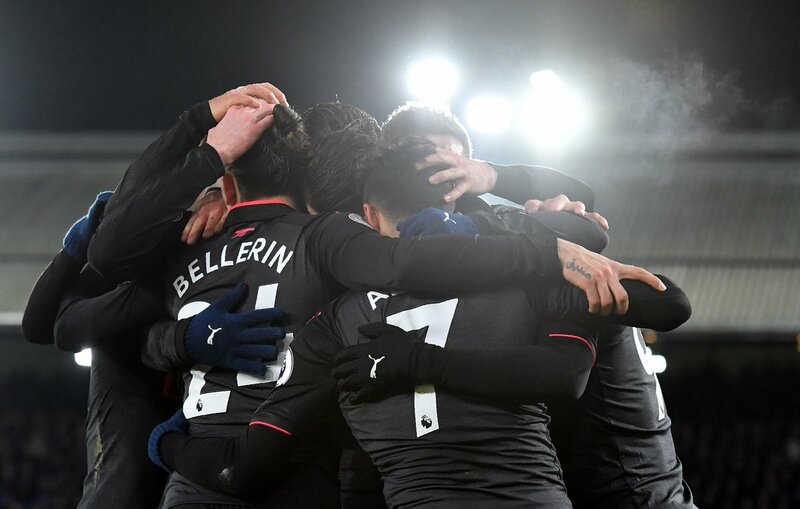 It’s Arsenal for goodness sake — scoring and winning reflects well on the players involved, but they do it for Arsenal, and we fans are Arsenal. You are of course correct, but my ire was directed at Belli Button for losing the ball and allowing Zaha to make a very good cross. JW says talks are due and he is sure a new contract can be agreed. Thierry Henry says the mythical non team mate celebration of his goals by team mates shows Alexis is not liked and there is a split in the Arsenal camp, something too about empty seats, and how he would work for free for Arsenal, also spend spend spend and of course he is perfect and he knows this to be true as everytime he looks in the mirror the person looking back at him tells him so. Well I have been commenting far too much – or as I prefer to think – I am being far to eloquently loquacious (lol) so I must depart – but my final word is that I see La Caz as a distracting figure for the opposition, hence Alexis’ second goal last night — his goal scoring time will come – and that might be sooner rather than later, if we buy Zaha, or someone similar. Thanks Andy. I only saw the second half as the family insisted on Home Alone 2 so nice to hear of such a posituve start. Nice summary of the events.Certainly things to work on, such as wobbles, and some of the defending, but generally, played some very good stuff, and a thoroughly deserved win. Good to see what seems for now to be the beginning of redemption of Roy H, he appears at least to be one of the games gents, and always very respectful of our manager, unlike some. I was annoyed as any after Iceland, but English players woes are not all down to him, maybe England and Roy, and Liverpool and Roy were just not a good fit, but he proves himself a very decent club manager. Recovering from a surfeit of Merlot left me with two defensive solutions. First, cut off Hector’s top knot. The nano seconds its costing him in wind resistance is showing. Also, the defence must go on red alert whenever Alexis is fart arsin’ around in or near the centre circle rather than go onto sleep mode. That’s two goals in a week that indirectly were caused by his losing possession. He must be forgiven though for his two so well taken goals. Our third will live in the memory and should guarantee Jack a fine new contract. A good evening’s entertainment albeit not without a few panics, But that;s not the Arsenal way is it? My impression of the Henry/Souness “No-one likes him – rift in the dressing room etcetera” discussion last night was of two blokes with 30 minutes of broadcasting time to fill but only 20 minutes of actual material. Desperate stuff. My sleep app recorded 89% sleep quality. The “Arsenal won” sleep note I recorded contributed just 1% to that total (a lot less than swimming 50 lengths after work which accounts for 11% increase in sleep quality). V good preview Labo – joyful write up A5. Some of Ars’s play was sublime last night, and as already pointed out: the silence of the Eagles, astonishing. My head went into a spin when I heard our peeps singing Super Jacky Wilshere – over and over. I’ll have to watch it all again. Well done Arsenal. I didn’t see the match, but I’ve just read a comment from Mustafi about the challenges of switching between 3 at the back and 4. Might that have an impact on the solidity of the defensive performances as they learn to be comfortable with switching from game to game and even within games? It seems to me that if you have a back 4 or a back 3 you are making a big decision not only about the role of Hector and Sead, but also the midfield players. GF60, me and my lads were also discussing the reduction in speed of Hector the longer his hair grows, we thought a Delilah may be in order. My lad, who watched him come through the ranks and had him marked as his favourite player also suggested the Milan fashion was affecting him. Obviously we are not tactical genius’s but it seemed to fit his loss of form. As I said earlier Andy you are to nice, TH and GS had enough material to fill a month of Sundays in a highly contested 2-3 encounter. Both teams switched tactically several times the fact the celebration was even considered shows their lack of nouse and confirms to me even more we can’t have TH anywhere near the coaching staff. Passenal switching from 3 to 4 or even to 5 makes absolutely no difference to players tracking players without the ball, it’s basic and also very often midfielders who are the guilty partners. ian I agree with you on all of that. I see some Arsenal bloggers and podcasters, you know the experts of the Arsenal fan base, today have a twitter conversation on the topic of Pep and what he could have done with Arsenal if he was our boss. Pep would win the title at Arsenal within two years of taking over. Not only that but he would be winning the title this season with the squad AFC have already. I kid you not, they are saying Pep would win the BPL for AFC without spending, that the £400M he has spent at city is just a stick AKB’s and Pep’s distractors use to beat him with. Posted about it a few days ago but Mourinho’s latest calculated big play, talking about money and its impact, is pretty incredible. Also the great flaw in the logic…i.e if City being the one club richer than his means it will be extremely difficult for him to beat them, doesn’t that mean all other clubs are at a bigger disadvantage to City and also at a disadvantage to Utd, and so forth, relative to all clubs spending power? And that then applies to all clubs over all seasons, past present and in the future. From what I’ve seen, few journo’s, Castles aside, have been willing to support Mou on this, which was to be expected, as for reasons I don’t fully understand the entire profession is keen to downplay the relationship between spending and success at the very top of the league, most of the time. However, not one of them has pursued the line of thought that if mourinho is right, or wrong, then what an incredible hypocrite the man is, and what low and lousy behavior from him during all the years he had the financial upper hand to, basically, refute suggestions money was key to success. In particular, they should, naturally, consider the implications in his relationship with his biggest foe, Wenger. All the years of antipathy, all the low comments, all while doing everything to downplay or exclude the role of finances in any discussion of Wenger’s work and capabilities. It’s so damn poor for none of the media to pick up on any of that. But again, it has to be expected. They couldn’t mention it without introducing a herd of elephants in the room relating to their own conduct. That is, the truth has been there all along, and they surely always knew it. Every manager should be judged in relation to the financial power at their disposal. Probably just my imagination but we seem to be playing a lot of away games atm. Thought that myself. Think it might have something to do with our two home games in this period- Liv, Chelsea- being such tough ones. Add that to our two away games being at grounds we lost last year and where games have been tough recently, plus our away form being down on normal, and it left us with a four game spell where we are not huge favourites in any game, whereas at home against anyone outside top six we are. I’m guessing rest of top six have at least one home game against weaker opposition, and some will have two. Actually, trying to make sense of jam-packed schedule…it’s not till March that we get a run of nice-looking fixtures in league, with 3 of 4 at home against lower teams. Watford, Stoke, Saints, with a trip to Leicester in same period. Get to that in good shape and those games should set us up nicely for final stretch, but boy there’s a lot of hard work between now and then. Away form has actually picked up a fair bit. 2 wins, 2 draws in last 4. 3 wins, 2 draws, one defeat in last 6, with only loss being against City. rich forget the media not asking or highlighting the hypocrite jose is over his money talk and his jibes at Wenger down the years on that subject, where are the Arsenal blog articles on the matter. Once again we can not complain about the splinter in the media’s eye when we ignore the plank in our own. took less then 24 hours for a headline supporting the Agent’s Best Friend to appear in as ridiculous and discredited a sports section of a rag top such as the Manchester Grunt. I wasn’t anticipating any critique of the checkbook manager who isn’t even as good a checkbook manager as Big Sam from these jaundiced & craven hacks. Not after they couldn’t muster a simple snigger and critique after he failed with foot ballers such as Robben, KDB, Salah etc and replaced them, at no small cost hehe, with mules like Cuadrado. …thanks to all for the review and comments on the recent Football game which some of us could not watch. Still haven’t seen any highlights. Sure would like to see an Away team in N5, such as say: Liverpool, pick up a deserve first half yellow which will impact their game plan, and less Darrell Hair inspired “Theatre” (Mwah Mwah my dahlings), then I’m sure we’d notice the opponents “wobble” more often if the rules were applied evenly by the heirs of Don Revie, the Rejectors of Clough, the pgMOB hacks.